The schedule has been announced and tickets for members are on sale for this year’s New York International Children’s Film Festival (regular public gets to buy on the 25th). As I’ve been saying for the last 20 years the festival is one of the best festival of any sort anywhere in the world. This is truly great films (seriously they don’t schedule bad films) for everyone – and I do mean everyone since the films span the spectrum of every type imaginable. As I’ve done the last 19 years I’ll be in the trenches seeing films and having a blast. I’m hoping this year to get my niece to come along for her first dip in the pool of NYICFF fun- I know that once she gets in the middle of the t-shirt toss she’ll be hooked for life. If you haven’t gone before take a look at the schedule (here) and buy tickets. You don’t need a kid to go- I’ve only had a niece for six year but I’ve been going for 20 years- so clearly I’ve been going with Randi and lots of other friends for all that time. It doesn’t matter who you are so long as you like great films and want to catch t-shirts you’re welcome. 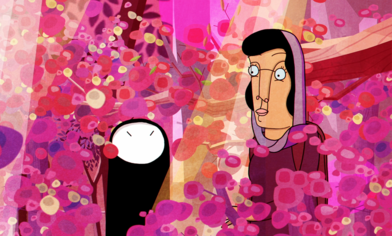 WINDOW HORSES- one of 2016’s best film is probably going to not be on your radar but absolutely should be and it should one of your first choices.. The story of a half Chinese half Persian young poet from Canada who goes to Iran after being invited to a poetry festival will knock your socks off . A deeply moving the film it is a work of cinematic art at it’s highest level and a damn good tale to boot. Here is my review from Toronto. MY LIFE AS A ZUCCHINI- is another must see at the fest. In the running for multiple Oscars- Best Foreign Film and Best Animated Film. MY LIFE... is premiering it’s English dub (GKids is doing it so don’t worry) at Sundance which will then open the festival this year. Another one of 2016’s best films multiple reviews are coming from Joe Bendel (after the Sundance premiere) and myself (when the film hits theaters). All you need to know is this is one of the best representations of being a kid ever put on screen…though it is appropriately dark at times so leave the real little kids home. GO SEE ANY AND ALL SHORT COLLECTIONS- I don’t know what’s in any of them- I don’t care because the shorts the festival picks are always choice and almost always have some of the best films you’ll see all year of any length. 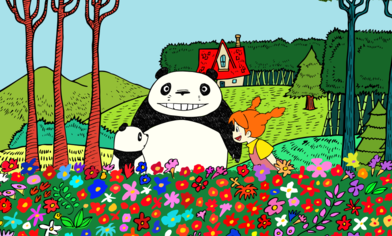 GO PANDA GO if a pre- studio Ghibli project that was worked on by both Isao Takahata and Hayao Miyazaki. If you look at the picture above you'll clearly see signs of treasures to come. While geared toward little kids the films (there are two stories) are a great deal of fun even for big people. I saw the film back a number of years when the film was run at NYICFF. I liked it so much that I went out and bought it. ANY OTHER FILM SCREENING- let's face it everything they run is good. In 19 years I've only seen one film that should never have been at the festival- one. Basically that means your odds are great at finding a film you'll love. The films and tickets can be found here.